All look like normal stones and are so similar in appearance that you cannot tell them apart. But these three types of stones are very different in how their surface feels when touched (some smooth, some rough), how the stones crack, their color, etc. These fine-quality stones are very brittle, and inherently crack in a sheet-like shape, like mica. Basically, they are grayish white in color, but depending on the mined site, they can be tinged with green, pink, and black. When crushed, all become white powder, which feels smooth and silky. They are sometimes called “Kinu-unmo” or “Muscovite”. Pottery stones are shipped out as materials for tableware and ceramics, etc. They make up the highest production volume at our mine and represent Tsuchihashi Mining’s products. Given their fire-resistance and characteristic transparent white color when fired as pottery or ceramics, they are an important material determining product quality. The pottery stone ore shown in the earlier photograph is a particularly high-quality special-grade material among our pottery stones. Pottery stones are generally finely crushed, and used as the material for ceramics, bone china, and sanitary ware (toilets, sinks, etc.). Ceramics materials are produced by a wet-classifying method called “elutriation,” which uses the difference in specific gravity. Our pottery stones are also made into materials for ceramics by elutriation. However, as we do not have facilities for elutriation and fine crushing, we usually outsource the production to a nearby crushing company when supplying elutriated ceramics materials. Other applications of pottery stones include abrasive grains (powder used by grinding wheels for polishing metal surface, etc.) and cosmetics. Products are shipped out from our mine in sizes of <= 10 mm obtained by roughly crushing the stones. They are shipped in bulk or by filling flexible containers using large trucks. (Pottery stone, Special Grade) Material for Western style tableware (bone china), ceramics, etc. (Pottery stone, Grade 1) Material for sanitary ware, Western style tableware, ceramics, insulators, etc. (Pottery stone, Grades 2, 3) Material for ceramics, insulators, etc. 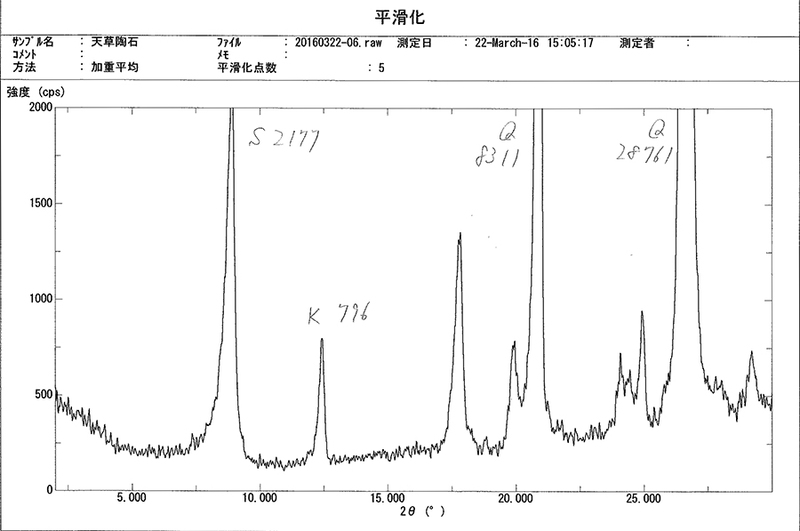 The following shows an example of the X-ray diffraction (XRD) results of Tsuchihashi Mining’s Special Grade pottery stone. 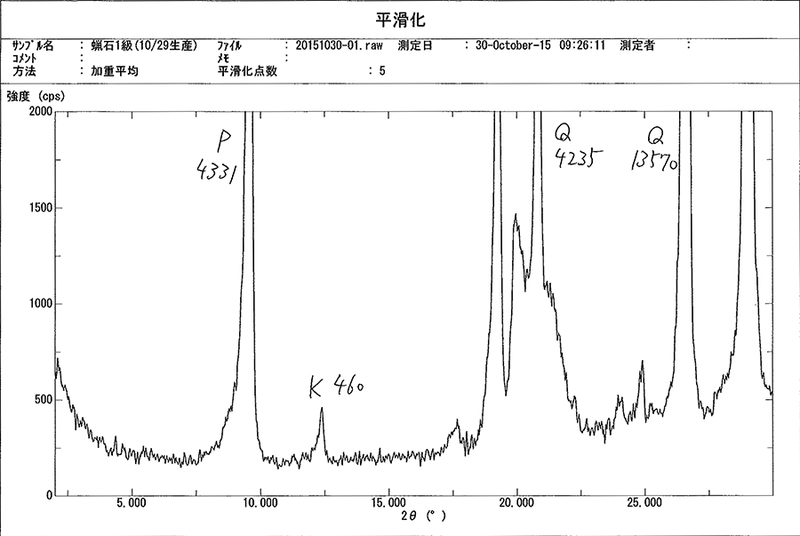 In the component analysis, a characteristic point is the low Fe2O3, and this determines the whiteness of the pottery stone color. For ceramics, in particular, we ship pottery stones below 0.2%. For reference, let’s compare the differences between Amakusa pottery stone and our Tsuchihashi pottery stone in terms of X-ray diffraction. As can be seen, Amakusa pottery stone shows a peak in kaolin (kaolinite), unlike Tsuchihashi pottery stone. This is a major difference. In terms of component analysis values, Amakusa pottery stone tends to have slightly more Fe2O3 than Tsuchihashi pottery stone. On the other hand, Amakusa pottery stone has very little TiO2, about one-tenth of that in Tsuchihashi pottery stone. The TiO2 content of Tsuchihashi pottery stone is about the same as normal soil on Earth. Thus, Amakusa pottery stone has a lot of iron but little titanium, and Tsuchihashi little iron but ten times as much titanium as Amakusa. These are two major differences in the production of ceramics. While Amakusa pottery stone is a well-known ceramics material, our Tsuchihashi pottery stone is not widely known. Still, by maintaining abundant tonnage and high quality, we hope to continue supporting the ceramics industry from the shadows. Like wax candles, Rouseki is white and semi-transparent, and has a waxy texture when touched. It is very brittle, and tends to crack largely along the stone joints. Up close, this stone looks grayish white, but may look blue from a distance. The ore looks so similar to pottery stone ore that they cannot be distinguished. But there is a difference in their texture, color, and how they crack, and with experience, their differences become more visible. They not only look and feel different, but their applications and properties also differ significantly. When Mitsuishi’s Rouseki was first mined during the Meiji era, it was used for making slate pencils for school. 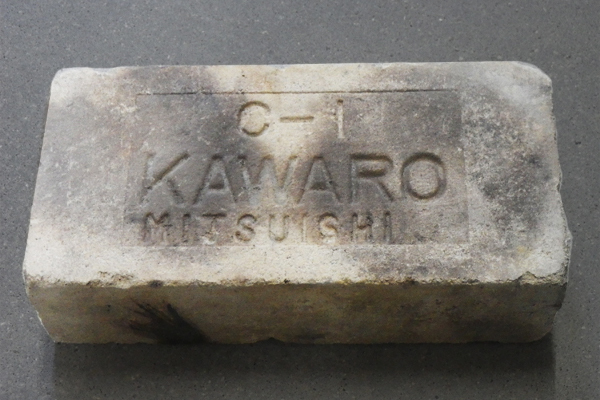 Mass production began when Rouseki started being used as the material for firebricks. 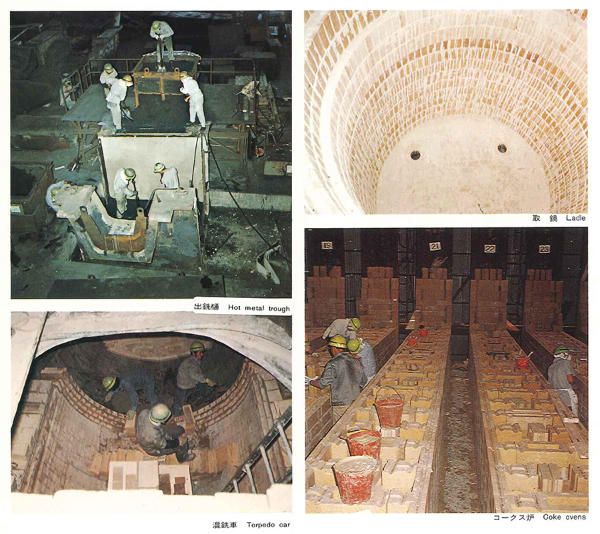 The manufacture of firebricks, which makes use of the high fire resistance of Rouseki, still serves as the main industry of Bizen City today. The products are shipped out as the material for blast furnaces of iron mills and smelters, various other furnaces, incinerators and heat-resistant parts. However, most of the Rouseki used in Bizen City today is imported from overseas, and less and less of Japan’s Rouseki, like ours, is used. The reasons include the depletion of resources of Japanese mines, intensifying price competition, and decreasing demand for Rouseki bricks. Tsuchihashi Mining continues supplying Rouseki as one of the few remaining suppliers of heat-resistant Rouseki in Japan. 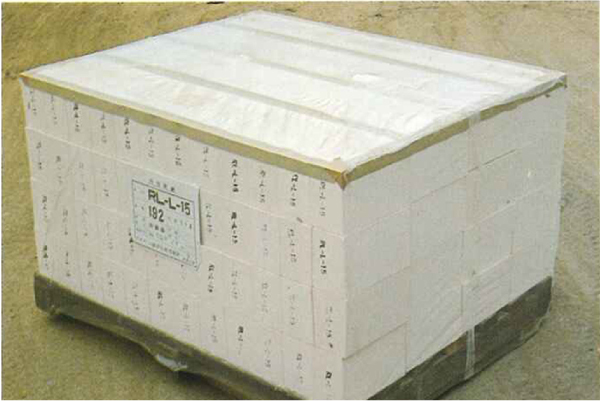 Rouseki clay is used for the coated surface of paper. It is also used on the surface of bills. Another major application is Rouseki clay. Most of our Rouseki is shipped out as the material for Rouseki clay. 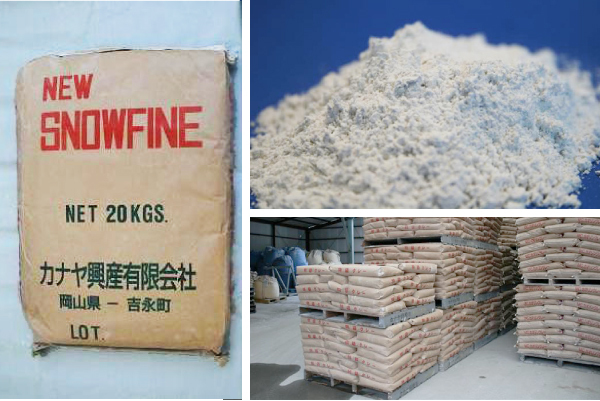 Rouseki clay itself is used for paint agents added to paint, coating agents for paper, flame retardants for rubber products, etc. Other applications of Rouseki include crucibles used for casting metal products, and ceramics glazes. Products are shipped out from our mine in sizes under 10 mm obtained by roughly crushing the stones. They are shipped in bulk or by filling flexible containers using large trucks. (Rouseki, Grade 1) Firebricks, crucibles, glazes, fire-resistant powders, etc. 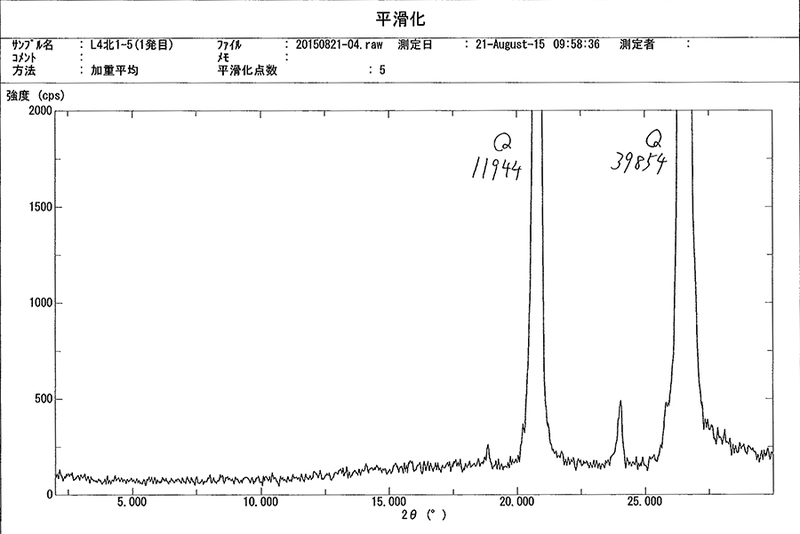 The following shows an example of the X-ray diffraction (XRD) results of Tsuchihashi Mining’s Grade 1 Rouseki. With our Grade 1 products, Al2O3 is about 20–24%. In the ore state, Rouseki with Al2O3 close to 27% can sometimes be mined. With our Grade 2–3 products, it is about 16–18%. As for the whiteness required in Rouseki clay, based on Hunter whiteness, it is about 80–84 in our Grade 1 products and above, and 78–80 in our Grade 2–3 products. We ship our Rouseki products mainly to Rouseki clay factories. Yoshinaga area next to Mitsuishi area in Bizen City, where our mine is located, also used to be a Rouseki mining town and a leading production site of Rouseki clay. 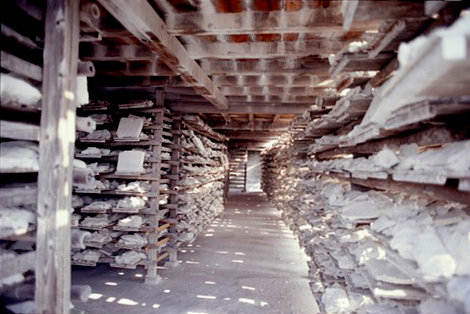 Although its heyday has passed, there are still some Rouseki clay factories around. Rouseki clay is made by elutriation. 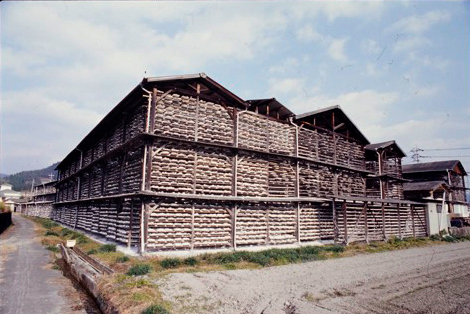 This photo shows a factory that is still manufacturing the traditional sun-dried Rouseki clay. 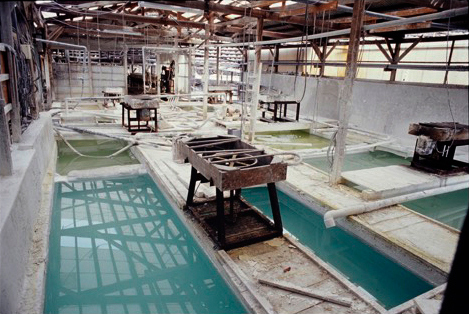 The solvent from finely crushed Rouseki stones is poured into this pool to collect unnecessary silica. Rouseki solvent is poured into the filter press to filter out the water. For sun-drying the pressed cakes. Inside the drying shelf. After drying, the clay is placed in flexible containers or paper bags. The applications of Rouseki clay are diverse. 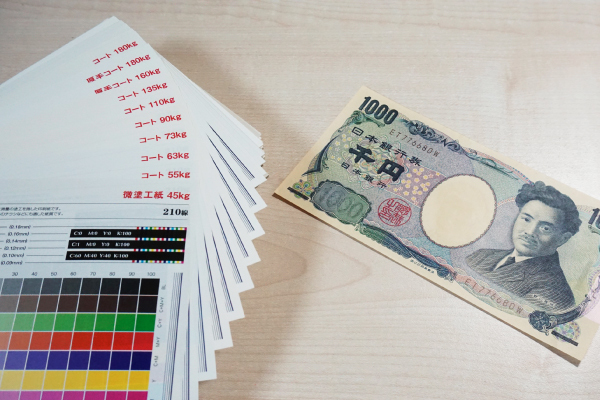 Familiar products include as a coating agent for the surface of bills (Bank of Japan notes). In the past, it was used in large amounts for coating the paper for printed matter such as photo magazines. Rouseki clay enjoyed its peak prosperity from the end of the Japan-Russia War, which marked the start of paper media as a giant industry, to the high economic growth period after World War 2. Paper is coated to facilitate printing. The surface of just-manufactured paper is rough; Rouseki clay is used to make the surface smooth and facilitate the printing of ink. Today, shipments of Rouseki clay for coated paper have dropped significantly. In its place, coating agents made of calcium carbonate are mostly used. Clay is also included in coating materials such as paint and ink. 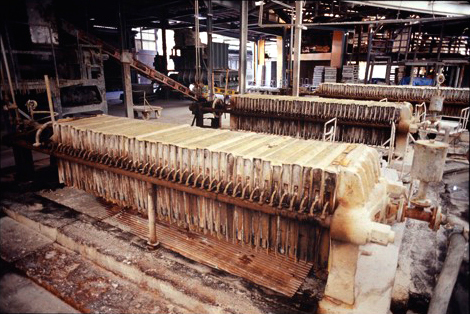 Rouseki clay is used as a coating additive due to its unique viscosity. When painting with a paint brush, the paint on the brush must spread smoothly over the surface to be painted. Also, once applied, the paint must not drip. Rouseki clay boasts these contrasting properties of “spreading smoothly” and “not dripping.” As a coating, whiteness is the top-priority requirement. Silica itself is very hard, but it is also brittle, which makes it easy to crush with a hammer. It comes in various colors such as white, purple, and black depending on the worked surface. 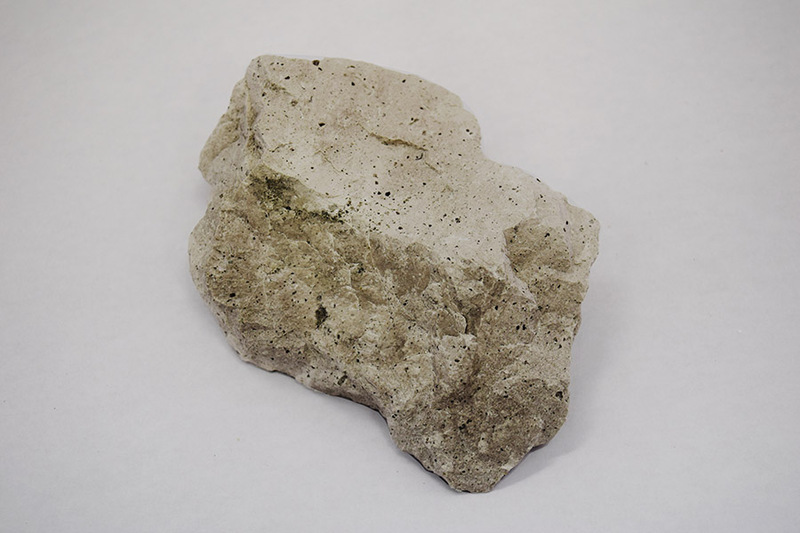 Sometimes, pores that look like air bubbles can be seen on the surface of the stone. When magnified under a microscope, countless pores (porous surface) can be observed even at the micrometer level. Silica is mainly used as a carrier of agricultural chemicals. Finely crushed silica powder is coated with agricultural chemicals and sold on the market for agricultural use. 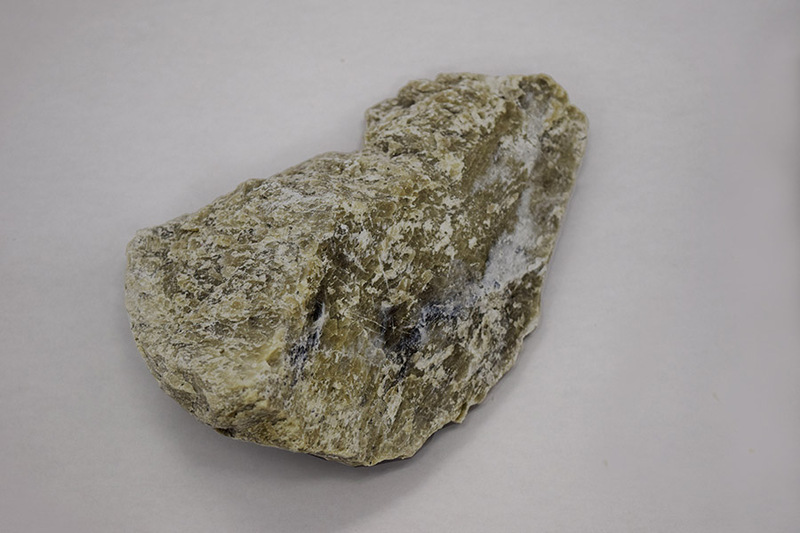 Silica itself has no effects; it merely serves as a carrier, and so can be dispersed without affecting the farmland, which makes it advantageous as a core material. Our silica has beneficial features for application as an agricultural chemical carrier, including easy crushability and white color. The Mitsuishi area in Bizen City, where our mine is located, is known for having the largest Rouseki deposit in Japan, yet the existence of this extensive silica mine was unknown until recently. 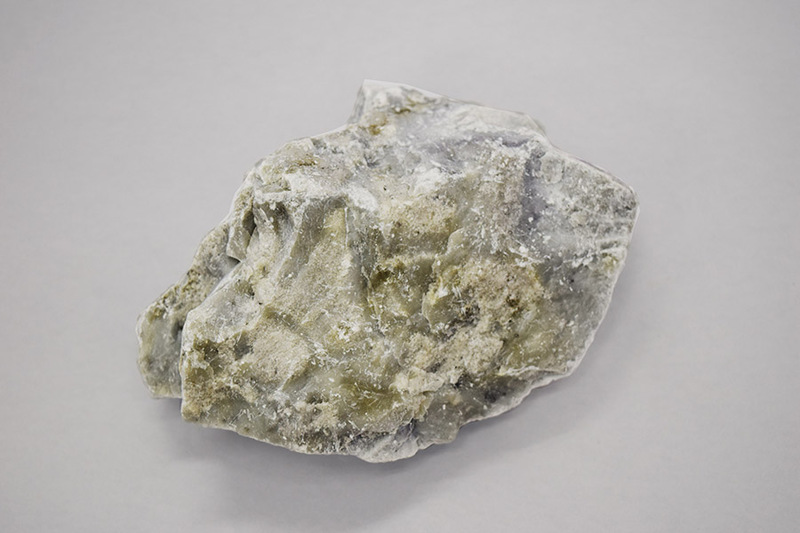 In the Mitsuishi area, we are the only company producing ore reserve silica in large volumes. Other applications of silica include additives for continuous casting powder, construction board, electronic boards, etc. 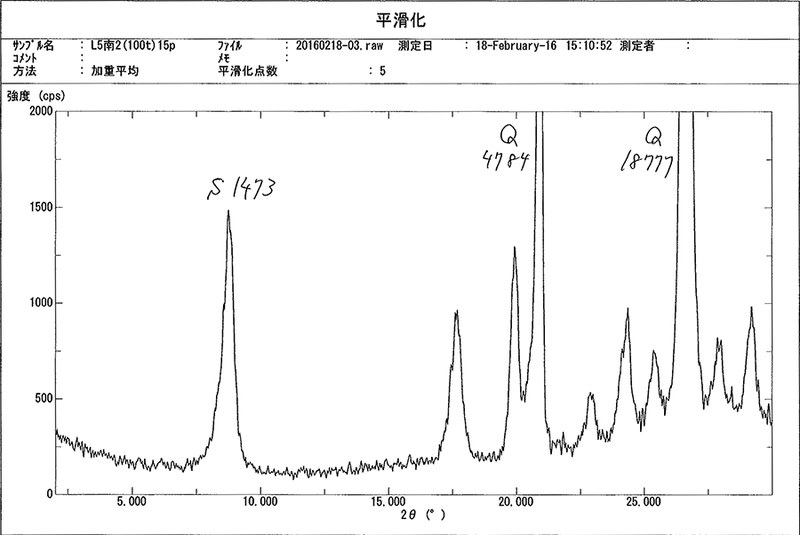 The following shows an example of the X-ray diffraction (XRD) results of Tsuchihashi Mining’s Grade 1 silica. Silica is used as the material for Western tableware, luxury tableware, pottery for decoration such as pottery plates. Compared to other pottery stones, silica characteristically has a high K2O content. 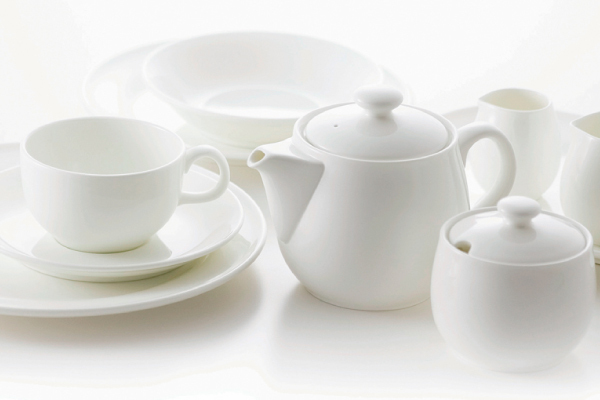 Used as the material for Western tableware, luxury tableware, etc. Unlike the Special Grade, it has a low amount of K2O. <= 10 mm Used as the material for ceramics and insulators, etc. Differs from Grade 1 in that it contains clay minerals such as montmorillonite. <= 10 mm Used as the material for sanitary ware, Western tableware, ceramics, insulators, etc. Our core product and grade with the highest production volume. <= 10 mm Used as the material for ceramics, insulators, etc. <= 10 mm Used as the material for ceramics, insulators, tiles, etc. <= 10 mm Rouseki suitable for firebrick material (SK29 and 30). Used as the material for the ladles of steel mills and smelters. Other applications include crucible material, heat-resistant materials, etc. 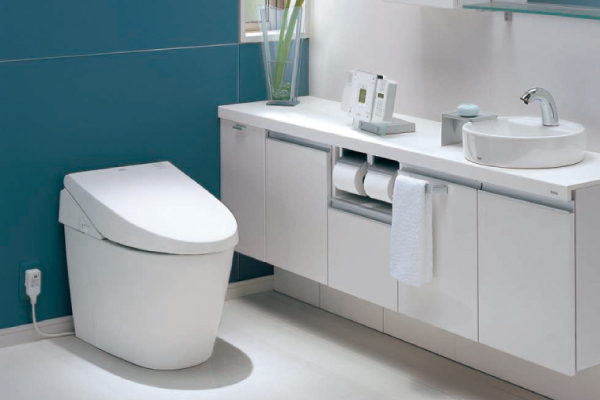 It is also added to products used in daily life such as earthenware pots for cooking hotpots, etc. Smaller than fist size Rouseki suitable for clay material used for various purposes from paint to pigments, paper coating agents, fillers, agricultural chemical fillers, etc. Mainly shipped to local clay factories. In the ore state, Hunter whiteness is around 80. Silica with more than 98% SiO and less than 0.5% Igloss. White in color and its porous state makes it easy to crush compared to general silica. Used as the material for agricultural chemical carriers, construction board, heat-resistant material powder, etc. * All our products are excavated at our own mine. * In addition to the above, we can also ship products of various grades and particle sizes according to the needs of users. (C)Tsuchihashi mining Co.,Ltd. All Rights Reserved.